What are you doing right now? Are you walking to lunch and checking your phone for the latest scientific studies? Are you sitting at work, just taking a brief moment to glance at your cell and ensure you don’t miss any of the action? If you aren’t on a cell phone, know that your kind are becoming a rarity—that you are in an ever diminishing, some what tenuous, group. Many of us use our cell phones to search the internet and communicate. We do it while working, while shopping, while jogging, and even while driving. According to a Pew research study, 34% of mobile internet users go online primarily, almost exclusively, using their phones. And it’s not having a great impact on our bodies. On average, we spend a staggering four hours a day looking down to read something—usually, we are checking our phones. Ultimately, each year, this adds up to a total of 1,400 hours of extra stress on our cervical spines (the part in our necks just above our shoulders). And this is where the latest study comes in. Kenneth Hansraj, chief spinal and orthopaedic surgeon at the New York Spine Surgery and Rehabilitation Medicine, recently published a paper on spines and cell phone use. 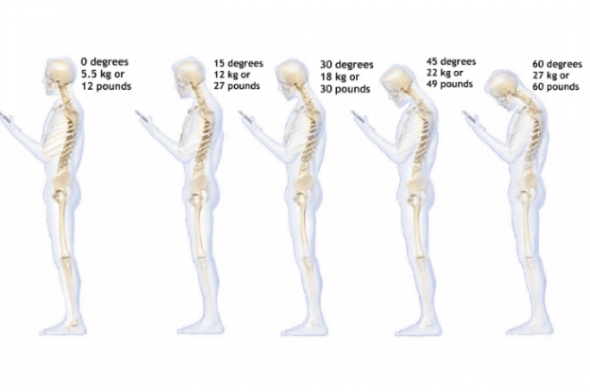 In the paper, he asserts that, every time we look down to check our phones (or complete a similar activity), we’re putting about 60 pounds (27 kg) of force on our necks. Since cell phone use in increasing so much, this is a little but troubling. It is especially worrisome as we still don’t know what the long-term effects of this will be. For his research, Hansraj used a 3D model of the human spine to measure the effects of constantly bending our heads down to check our phones. Because our heads are pretty heavy (they can weigh up to 12 pounds [5.5 kg]), it obviously requires a bit of effort to hold them up. And when we look down at our phone, we are increasing the gravitational pull, making our necks work harder. The fact that this posture increases stress on our necks probably won’t come as news to anyone. However, the amount of force that Hansraj measured is rather impressive (and worrisome). Of course, this does not mean that cell phones are bad, or that we need to be overly concerned about our increased use of this technology. Indeed, as Hansraj notes, he does not expect anyone to sacrifice their phone to save their spine; however, it is important to be conscious of the problem. Such knowledge will enable us to correct our posture as we’re checking our phones (or reading a book or doing a similar activity), and this will greatly help in the long-run. So it’s really just a reminder that you need to consciously think about your posture. Astronomy Photo of the Day: 11/21/14 — The Lush Green Marble? Can Prolonged Silence Really Lead to Insanity?